In this lesson, we will learn how to calculate the moment of a couple of two forces about a point in space. The two forces ⃑ 𝐹 = − 3 ⃑ 𝑖 − 4 ⃑ 𝑗 1 and ⃑ 𝐹 2 are acting at the points 𝐴 ( 6 , − 2 ) and 𝐵 ( 8 , − 3 ) respectively. Given that they are forming a couple, determine the vector of the couple moment. Given that two forces ⃑ 𝐹 = − ⃑ 𝑖 + 2 ⃑ 𝑗 1 and ⃑ 𝐹 2 are acting at two points 𝐴 ( 2 , 2 ) and 𝐵 ( − 2 , − 2 ) respectively to form a couple, find the perpendicular distance between the two forces. 𝐴 𝐵 𝐶 𝐷 is square having a side length of 3 cm. 𝐻 and 𝑂 belong to 𝐵 𝐷 , where 𝑚 ∠ 𝐶 𝐻 𝐷 = 𝑚 ∠ 𝐴 𝑂 𝐵 = 6 0 ∘ . Given that two equal forces, each of magnitude 5 N, are acting along  𝑂 𝐴 and  𝐻 𝐶 respectively, find the magnitude of the moment of the couple. 𝐴 𝐵 𝐶 𝐷 is a square of side length 8 cm, where two forces of magnitudes 21 N are acting at 𝐵 and 𝐷 respectively, and their lines of action are in the direction of  𝐴 𝐶 and  𝐶 𝐴 respectively. Determine the magnitude of the moment of the couple. 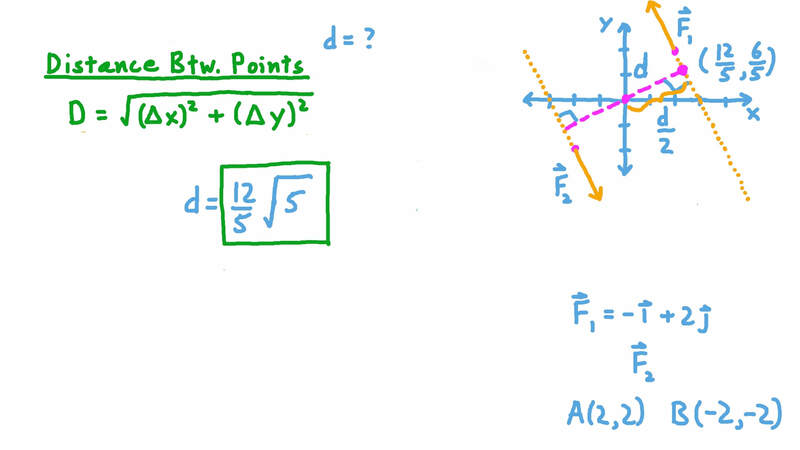 Aa pair of parallel forces with equal magnitude and opposite direction which do not lie on the same line of action. C a pair of forces with the same magnitude and direction. 𝐴 𝐵 𝐶 𝐷 is a rectangle, in which 𝐴 𝐵 = 5 c m and 𝐴 𝐷 = 1 0 c m . Two forces of the same magnitude 3 3 √ 5 N are acting at 𝐴 and 𝐶 in the directions of  𝐵 𝐷 and  𝐷 𝐵 respectively. Determine the magnitude of the moment of the couple. 𝐴 𝐵 𝐶 𝐷 is a parallelogram, where 𝐴 𝐵 = 1 0 c m , 𝐵 𝐶 = 8 c m , and the perpendicular distance between 𝐴 𝐵 and 𝐷 𝐶 is 6 cm. Given that two forces of the same magnitude 50 N are acting along  𝐴 𝐷 and  𝐶 𝐵 , respectively, determine the magnitude of the moment of the couple. 𝐴 𝐵 𝐶 𝐷 𝐻 𝑂 is a regular hexagon with sides of length 5 cm. Two forces of the same magnitude 13 N are acting along  𝐶 𝐵 and  𝑂 𝐻 , respectively. Determine the magnitude of the moment of the couple. In the figure below, 𝐹 = 3 1 N and 𝐹 1 and 𝐹 2 form a couple. Find the algebraic measure of the moment of that couple. The given figure shows two forces each of magnitude 267 newtons acting on two edges of a lamina in the form of a rectangle with dimensions 𝑥 = 4 2 c m and 𝑦 = 8 4 c m . Find the moment of the couple if t a n 𝜃 = 3 4 . Given two forces in a couple, what is the name given to the product of the magnitude of one of the forces and the perpendicular distance between the two forces? 𝐴 𝐵 𝐶 𝐷 is a parallelogram, where 𝐵 𝐶 = 1 0 c m and 𝑚 ∠ 𝐴 𝐵 𝐶 = 1 5 0 ∘ . If two forces of the same magnitude 50 N are acting at  𝐴 𝐵 and  𝐶 𝐷 respectively, determine the magnitude of the moment of the couple, rounding your answer to two decimal places. 𝐴 𝐵 𝐶 𝐷 is a rhombus in which its diagonal 𝐴 𝐶 = 7 c m and 𝑚 ∠ 𝐴 = 6 0 ∘ . Given that two equal forces, each of magnitude 45 N, are acting along  𝐴 𝐷 and  𝐶 𝐵 respectively, find the magnitude of the moment of the couple rounded to two decimal places if necessary. 𝐴 𝐵 𝐶 𝐷 is square having a side length of 24 cm, 𝐸 ∈ 𝐵 𝐶 , and 𝑂 ∈ 𝐷 𝐴 , where 𝐵 𝐸 = 𝐷 𝑂 = 6 c m . Given that two forces, each of magnitude, 34.2 N are acting along  𝐵 𝑂 and  𝐷 𝐸 respectively, find the magnitude of the moment of the couple. 𝐴 𝐵 𝐶 𝐷 𝐻 𝑂 is a regular hexagon, having a side length of 5 cm, where a force of magnitude 15 N is acting along  𝐶 𝐻 , and another force of the same magnitude is acting at 𝐴 in the direction of  𝐻 𝐶 . Determine the magnitude of the moment of the couple. 𝐴 𝐵 𝐶 𝐷 is a rhombus, where its diagonals 𝐴 𝐶 and 𝐵 𝐷 are 13 cm and 7 cm respectively, and two forces of the same magnitude 23 N are acting along  𝐴 𝐵 and  𝐶 𝐷 . Determine the magnitude of the moment of the couple, rounding your answer to two decimal places if necessary. If the norm of the moment of a couple is 750 N⋅m, and the magnitude of one of its two forces is 50 N, determine the length of the moment arm. 𝐴 𝐵 and 𝐶 𝐷 are two parallel chords in a circle whose radius is 25 cm, and they are at different distances away from the circle’s centre, where 𝐴 𝐵 = 3 0 c m , and 𝐶 𝐷 = 1 4 c m . Given that two forces of the same magnitude 20 N are acting along  𝐵 𝐴 and  𝐶 𝐷 , respectively, determine the magnitude of the moment of the couple. 𝐴 𝐵 𝐶 𝐷 is an isosceles trapezium, where 𝐴 𝐷 = 𝐵 𝐶 = 1 3 c m , 𝐴 𝐵 = 1 2 c m , and 𝐶 𝐷 = 6 c m . Two forces, each of magnitude 50 N, are acting along  𝐴 𝐵 and  𝐶 𝐷 . Find the magnitude of the moment of the couple rounded to two decimal places, giving your answer in N⋅cm. A light rod 𝐴 𝐵 , which has a length of 22 cm and a mid-point 𝑂 , is under the action of two forces measured in newtons as shown in the figure. Given that a moment of magnitude 22 N⋅cm is acting on the rod perpendicularly to the vertical plane, determine the moment of the resultant couple acting on the rod. If the two forces ⃑ 𝐹 = − 4 ⃑ 𝑖 + 𝑎 ⃑ 𝑗 1 and ⃑ 𝐹 = 𝑏 ⃑ 𝑖 + 8 ⃑ 𝑗 2 form a couple, then find the value of 𝑎 − 8 𝑏 . Given that the forces ⃑ 𝐹 1 , ⃑ 𝐹 2 , and ⃑ 𝐹 3 are acting at the points ( − 1 , − 6 ) , ( 3 , 8 ) , and ( 8 , − 8 ) respectively, where the system of forces is equivalent to a couple, ⃑ 𝐹 = 3 ⃑ 𝑖 − 6 ⃑ 𝑗 1 , and ⃑ 𝐹 = − 9 ⃑ 𝑖 − 4 ⃑ 𝑗 2 , determine the magnitude of the moment of the couple. Given that ⃑ 𝐹 1 and ⃑ 𝐹 2 are two forces which form a couple, where ⃑ 𝐹 = − 8 ⃑ 𝑖 − ⃑ 𝑗 1 , determine ⃑ 𝐹 2 . 𝐴 𝐵 𝐶 is a right-angled triangle at 𝐴 , where 𝐴 𝐵 = 1 2 c m and 𝐴 𝐶 = 1 6 c m . The two forces ⃑ 𝐹 1 and ⃑ 𝐹 2 , measured in newtons, are acting on the sides of the triangle as shown in the figure below. If the system of forces is equivalent to a couple, determine the magnitudes of ⃑ 𝐹 1 and ⃑ 𝐹 2 . The two forces ⃑ 𝐹 = − 6 ⃑ 𝑖 − 3 ⃑ 𝑗 1 and ⃑ 𝐹 2 are acting at the points 𝐴 ( − 3 , 0 ) and 𝐵 ( − 7 , − 9 ) respectively. Given that they are forming a couple, determine the vector of the couple moment.